Today’s find was beautiful to the inward vision as well as to the outward. 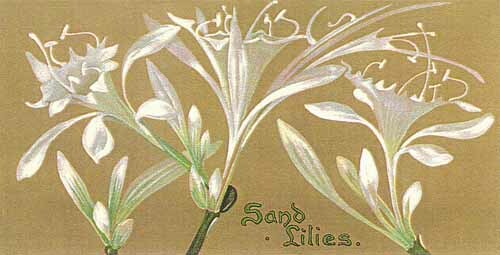 It was clusters of exquisite wild lilies - white and fragile and fragrant - growing out of the hot salt sand that drifts into dunes round the stunted juniper and lentisk bushes that fringe the shore. Down below the surface, the storage of reserve material in the lily bulbs had silently taken place… and there they had lain, shrouded and waiting. The hour had come now, and no adverse condition could keep back the upspringing. The same Lord over all can store the roots in His spiritual creation, even though they have but smothering sand drifts around them.